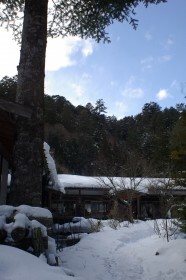 The nature of Kiso is felt for the natural fine tree forest at the foot of Mt. Nagiso at which it looks afar over the Araragi-river of the back. 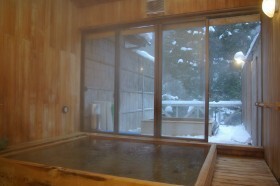 The bathtub of the Kiso precious wood and hot water also have a feeling to touch hot water fresh to enjoying oneself by the smooth hot spring of an alkali simple sulfur spring, and an only 1 guest for the day, and are a supreme hot spring. 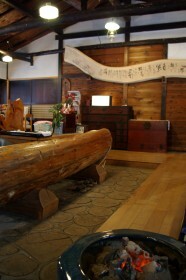 Before a hot spring comes out, he is the restaurant of the Yamaga dish. 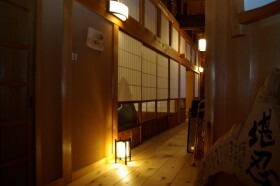 The front was dropped in repeatedly and it could not be in the fish preserve of a garden, the guest room building on a pond, the floor of timber brick, and the roofing board without interest at the effect unique to Takiminoies, such as a ceiling of cedar bark tension. 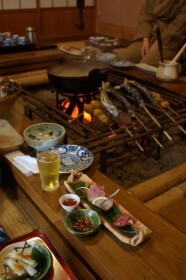 An only 1 guest for the day, the lodge of one-day lot limitation, and a meal are to between the sunken hearths of a structure with profound total Kiso hinoki and thick beam. the Yamaga dish which I receive in a sunken hearth, the cooked in a pot concerning a free key, and the get on skewer and skewered rice-cake with sesame, miso or soy sauce of char which are roasted over distant fire are full-scale very -- it is expectation -- a chest swelling salmon.